If you can’t get unlimited¹ calling to Portsmouth with your phone company, then it’s probably time for a change. Allow us to introduce you to our top plan, Vonage World®. It can help connect you to your friends and family back in Portsmouth without disconnecting you from your bank account. It’s time you got those cheap calls to Portsmouth you’ve been looking for! Vonage World delivers unlimited¹ calls to landlines in Portsmouth as part of its basic package. You’ll pay a low monthly rate and that’s it! You’ll also be able to call over 60 other nations’ landlines as well as cell phones in over 10 countries. And, to reach mobiles in Portsmouth, it’s only a small per-minute rate extra. 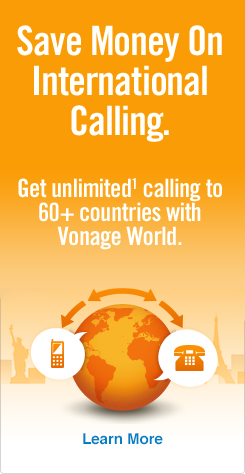 Calling to the UK from USA can be a no-brainer again, thanks to Vonage World. Check out the link to read up on the full plan details. Next, enter 44 — the country code for the UK. Then, dial 23 — the Portsmouth area code (landlines only*). Finally, finish with the local 8-digit Portsmouth phone number. *To call mobiles in Portsmouth, the steps are very similar to those in dialing a landline, just with a few minor differences. First, dial the US/Canada exit code as you normally would. Then dial the UK country code. Lastly, dial the 9-digit cell number. If you have plans to call elsewhere, you may want to check out our how to call the UK guide for other city area codes. Bring some sunscreen for starters, because this seaport town gets quite a bit more summer sunshine than the rest of the UK. It’s also the only island city in the country, which translates to a milder climate, so dress appropriately. Many who travel to Portsmouth enjoy the amazing views from the sail-shaped Spinnaker Tower, an architectural salute to the city’s nautical roots. It’s the tallest structure in the UK, outside London, that visitors can walk up. Have a great time in Portsmouth. It’s hard not to!